So a few weeks ago, we had a pipe burst in the guest bathroom of the Storybook House. We were pretty lucky - the guest bathroom is above the kitchen, and while the water destroyed the kitchen ceiling, it all went down into the basement, and down a floor drain. 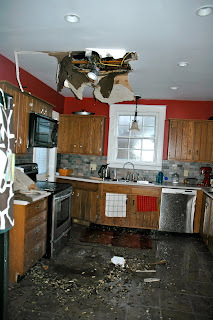 So, the only major damage was the kitchen ceiling. Really glad we tiled the kitchen floor - the tile kept the subflooor from soaking up water. So, what actually happened? The hot water supply line to the bathtub burst. At first, we thought maybe the pipe had frozen. But when I cut out the old pipe - sure enough, a hole had formed right on the side of the old steel piping. Must have been a weak spot…but it lasted for 80 years so i suppose it served its purpose well. To prevent any more occurrences like this one, I've now replaced all of the old galvanized steel water lines in the house with a combination of copper piping and PEX - which is a new-fangled flexible plastic tubing. Has pros and cons, but, for pulling through existing walls of an old house it's probably the best option out there - and far easier than trying to install rigid copper tubing without having to cut holes in the wall. The toughest part is stomaching the $100+ cost for a PEX crimp-ring tool. Ouch. In true Voss fashion, this was just the excuse I needed to justify a full renovation of the guest bathroom. Which gives us a perfect opportunity to restore the room to close to it's former 1930's glory. I'll be posting some progress, thoughts, dilemmas, and other hopefully information on the bathroom project over the next month or so. While it won't be a complete "bathroom remodeling 101" guide, it may even serve to help any other do-it-yourselfers who stumble upon this blog.